HPE has quit the business of providing custom servers to big cloud operators. 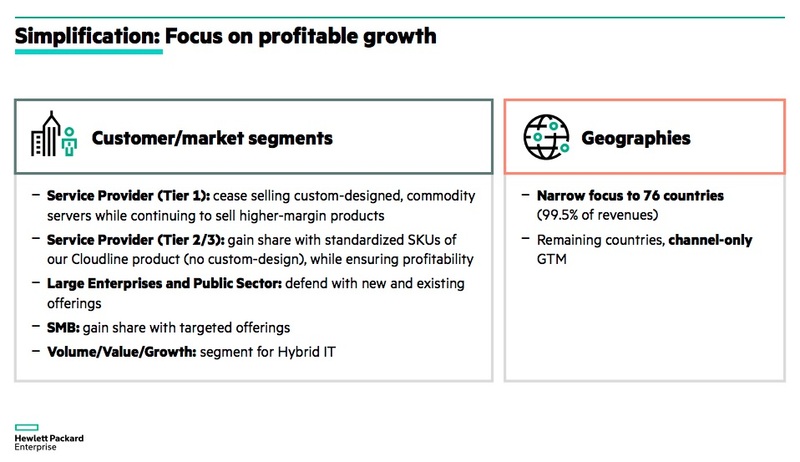 Now, however, HPE has posted slides that HPE president Antonio Neri presented to a financial analyst day this week. His third slide does the deed and is reproduced below. Just what the “higher-margin products” HPE can offer big clouds is not revealed. But we'd be surprised if it's something entirely new because the fifth slide in Neri's deck outlines extensive – ahem – consolidation of the company's products, locations and languages. Which may explain rumours the company plans to axe 5,000 jobs. The slide deck offers a few hints at the company's future directions, mentioning plans including: Something called “Project New Stack” that aims to offer “Hybrid as-a-service platform for application, data, and infrastructure composability across clouds”; Expanding the Aruba platform to challenge Cisco’s Meraki in the cloud-managed network; Developing SD-WAN capabilities as part of Aruba solutions to offer customers a single control point for Wi-Fi, switching and WAN; Extend programmability of campus aggregation switching with next generation of Aruba OS.